In order to minimize swarming, you can follow any number of standard recommendations. Even better, you can make your own informed management decisions if you understand the factors or cues that are involved in generating the swarm impulse. Change one or more of those factors or cues, and you may be able to prevent, arrest, or even reverse the swarm impulse. The greater the population of a colony, the greater the proportion of workers that can be involved in nectar foraging, comb building, and converting that nectar into honey. Thus, larger colonies make proportionally more honey per bee than do weaker colonies. Unfortunately, larger colonies are also more prone to swarm in the spring. The challenge to the beekeeper is thus to manage his/her colonies to grow to reach maximum size right at the start of the main honey flow, but at the same time trying to keep them from swarming during that process. Keep in mind that prior to the artificial division of hives by beekeepers, the only way for a colony to reproduce was by swarming. The swarm impulse is thus a hard wired innate behavior. And try as we might, we are unlikely to completely prevent it. But luckily for us, swarming is hardly a random occurrence. Natural selection mercilessly penalizes colonies that swarm without having all their ducks lined up. Swarming is high risk behavior for the colony, which can result in the death of the parent hive or the swarm if either is not able to then grow enough to survive the coming winter. Better for a colony to have second thoughts and postpone the swarm impulse, than to risk the gamble if all factors are not favorable. The thing then for us to understand is how the colony “mind” determines if and when conditions are conducive to the success of both the parent hive as well as the issued swarm. The corollary is that there is no evolutionary benefit to a colony to store more honey than needed for survival during dearth or winter–it is only to the beekeeper’s benefit for it to put away harvestable surplus honey. Accordingly, we breed for lines of bees that tend to store an unnatural excess of honey as opposed to swarming. 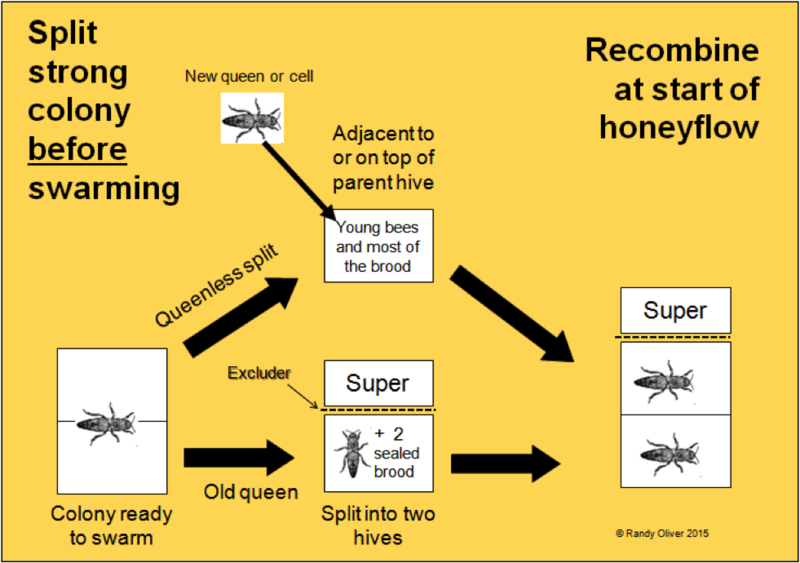 Queenrearing and swarming are extraordinarily complex functions involving well-timed and coordinated activities by thousands of individuals. It is more likely that there are multifactorial cues for the initiation of queen rearing, based on certain within-colony demographic factors which not only stimulate queen production but also contribute to the success of swarming…That is, queen rearing coincides with a short “window” in time during which colony conditions are most favorable for swarm production, and most of these colony characteristics must be at or near their threshold levels for queen rearing to begin. Practical application: the swarm impulse may start or stop, depending upon some combination of ever-changing environmental and in-hive “action thresholds”. By understanding what those thresholds are, the beekeeper may be able to manipulate the hive in order to trick the colony into “thinking” that conditions are not right for swarming. 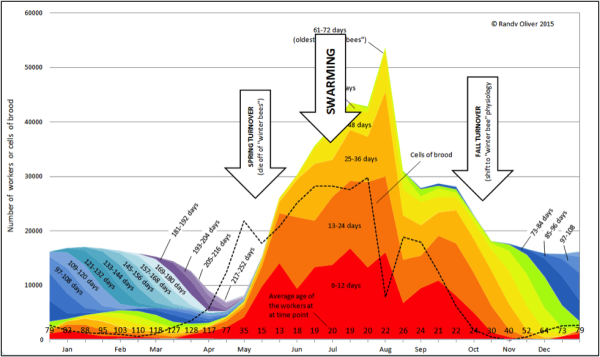 Swarming typically peaks in springtime in temperate climes, but it is not necessarily determined by the month of the year. The “time of season” to the honey bee colony has less to do with the calendar than it has to do with the phenology of the local flora, which in turn is determined not only by day length, but also by temperature and rainfall. Ponder on this: swarm preparation is likely decided and undertaken by workers who may have never ventured outside the darkness and regulated temperature of the center of the cluster. What cues would they have of how things are outside? Well, they would be acutely aware of the supply of fresh nectar and pollen entering the hive. The seasonality of colony buildup and decline is all about the supply of pollen and nectar—when pollen is abundant, colony population grows; when it is in short supply, colonies shrink (Fig. 1). Figure 1. A stylized plot to illustrate how the population of the colony follows the availability of pollen, rather than calendar date. The abundance of pollen depends upon local plant phenology, which in turn reflects temperature and moisture. In temperate climes, the low point of colony population typically occurs during the cold of winter; in arid subtropical climes, it may occur during the dry summer. And of course, successful foraging for that pollen is entirely dependent upon favorable weather. Practical application: depending upon your local plant phenology and the stock of bees that you keep , “swarm season” may occur well in advance of, at the start of, or even during the main honey flow. And “normal” timing can be completely thrown off by weather. This means that there is no one formula for the timing of successful swarm management. For a broader view, let’s consider the niche (a species’ “business plan”) of the European honey bee. The basic plan consists of two phases: (1) establishment, in which a swarm locates and occupies a suitable cavity. Should it then successfully fill that cavity with comb, bees, and honey, then there’s nothing left to do but to shift to Phase 2, reproduction. Reproduction consists of issuing as many drones and swarms into the surrounding area as possible without endangering its own survival. The production of drones and swarms is costly to a colony, and it generally does neither until it’s established a large broodnest. And even then, should resources become scarce, the colony will put reproduction on hold, and consume any drone or queen larvae and pupae. Nor does a colony just issue reproductives haphazardly; it times their production for when they stand the greatest chance of success, plus allowing for the recovery of the parent hive. Despite this caution, the probability, in temperate zones, of a swarm in the wild surviving through the next winter is still pretty low (with large, early “prime swarms” having the advantage). Such success depends largely upon there being enough remaining pollen and nectar flow(s) following issuance of the swarm(s). Thus, a swarm is generally most likely to succeed if it issues early in the season  (in the chart above, on the uphill slope of the pollen flow), or prior to the fall flow, when there is a second (but smaller) peak in swarming . A compelling aspect of the role of within-colony demographic factors in stimulating swarm preparation is that the cues involved allow workers to time swarming so as to coincide with colony conditions that maximize the chances for [both] successful swarm production and maintenance of the original colony. So once again we return to colony demographics. The most favorable point of time for a colony to swarm is when it reaches the peak amount of sealed brood and the highest proportion of young workers. This occurs about 6-8 weeks after the “spring turnover,” during the “linear growth phase,” but before colony population top out . Take a look again at the graph of Harris’ colonies (Fig. 2). Figure 2. The parent hive can best spare the loss of an expeditionary mission only once the broodnest has reached its peak size (dotted line), and there are plenty of young workers to go with the swarm. Note also the low mean worker age (lower row of figures) during the spring swarming window. Original data from Lloyd Harris . It is notable that queen rearing begins precisely when worker brood rearing is at its peak, and there are almost no unoccupied cells in the central brood area…Thus, colonies time their queen rearing to coincide with population peaks, and queen cell destruction may serve to ensure that colonies do not swarm until there are sufficient adults and brood to populate swarms and the original colony. Practical application: by making sure that there are always plenty of unoccupied cells in the broodnest, the beekeeper may trick the colony into thinking that it should keep trying to grow, rather than swarming. By doing so, one may even encourage the bees to reverse the swarm impulse and destroy any existing queen cells. 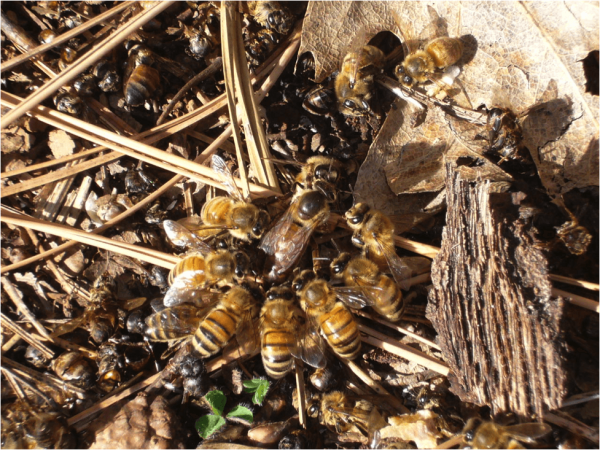 Swarming typically does not occur unless the hive is full of sealed brood (Fig. 3). Remember that the pupae in one frame of sealed brood will, when they emerge as adult bees, cover roughly three frames. This three-to-one expansion means that not only is the colony population about to explode, but also that it can quickly recover its worker population after the swarm has departed. Figure 3. Pupae are stacked like cordwood. But when a worker emerges as an adult, its body covers roughly three cells, resulting in a three-to-one expansion in comb coverage. Due to this expected explosion in cluster size, a colony can best afford to issue a swarm when it reaches its peak of sealed brood. Practical application: the removal of sealed brood may arrest the swarm impulse. Comb honey producers routinely remove the brood, and cram the queen and all the bees into a honey-filled single, placing the honey supers above. Despite being completely crowded and full of honey, those colonies won’t swarm, due to the lack of sealed brood. The Demaree method: one moves all the brood to the top of the hive, leaving the queen below. Since the bees below sense no brood present, they will not prepare swarm cells. The bees above, however, will start a number of emergency queen cells. If the beekeeper then returns 7-8 days later and meticulously cuts out every single queen cell (this generally requires shaking the bees from the combs so that you don’t miss any), then no more larvae of the right age will be present for the bees to start new cells, and thus swarming is averted. As the brood emerges from the former brood frames, the bees will fill those combs with honey . I credit beekeeper Walt Wright’s excellent observations for this term. During spring nectar flows, the colony shifts from consuming the honey stores above and around the broodnest (which had freed up additional cells for the expansion of the broodnest), to refilling those cells with any excess nectar (Fig. 4). To the colony mind, this is a strong cue that the colony has filled its cavity. Figure 4. In the darkness of the interior of the hive, the interface between the honey and the brood is carefully monitored by the bees as an indicator of resource abundance and the availability of empty comb in the cavity. The beekeeper can “read the combs” in the same way to determine what the colony is experiencing. In this photo, the bees can sense that the colony is full of sealed brood, pollen is abundant, there are adequate recently-capped honey stores, and that there is fresh nectar crowding the broodnest. This “backfilling” condition is a strong impetus for swarming. Practical application: early stimulation of colonies by supplemental feeding may increase the swarm impulse, especially if such syrup feeding causes crowding of the broodnest due to backfilling. Early nectar flows in excess of colony needs may do the same. A reduction in egglaying in a colony chock full of sealed brood (perhaps due to backfilling with nectar) appears to be a trigger for swarm cell initiation . 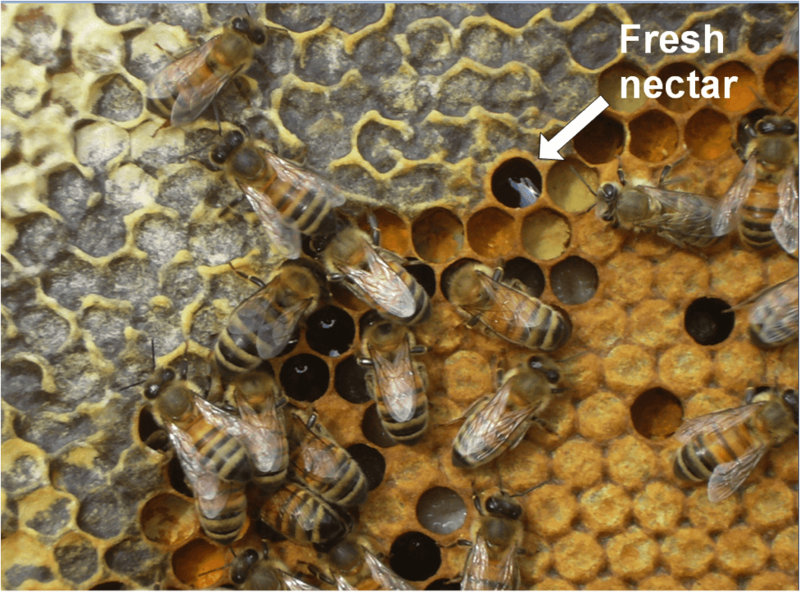 If you have early nectar flows, be sure to provide supers of drawn comb above the broodnest in which the bees can store incoming nectar, rather than backfilling the broodnest (this will also provide additional clustering space for the expanding population). Update Feb 2017: I recently heard a presentation by Dr. Jeff Pettis about some forgotten research that he published years ago. I feel that their findings really help us to understand a main trigger for the swarm impulse. Pettis , JS, HA Higo, T Pankiw and ML Winston (1997) Queen rearing suppression in the honey bee – evidence for a fecundity signal. Insectes soc. 44: 311 – 322. They found that the pheromone emitted by young brood acts as a “fecundity signal” to the colony–so long as young brood is present, the colony knows that the queen is laying eggs and that broodrearing is progressing normally. But when there is not enough pheromonal signal being produced by young larvae, that may trigger the colony to initiate supersedure or swarm cells. The above finding may help to explain why adding or rearranging drawn comb may help to prevent swarming–by preventing restriction of the queen’s ability to lay eggs, the colony doesn’t get the signal to initiate production of queen cells. Practical application: to prevent the initiation of the swarm impulse, take measures to ensure that the queen’s ability to continue to lay to her full capacity is not restricted. Update 20 May 2018 I recently reviewed a study by Simpson, who tested whether it was crowding of the adult bees, or restriction of brood area provided to the queen as being the trigger for swarming. Although he concluded that it was crowding, a question whether his restriction of the queen to 5 British Standard frames truly restricted her broodrearing, since my math suggests that those 5 frames might provide enough room for an average queen to always have young larvae present. Another cue to the workers involved in initiating the swarm impulse is the amount of empty brood comb available to the queen. 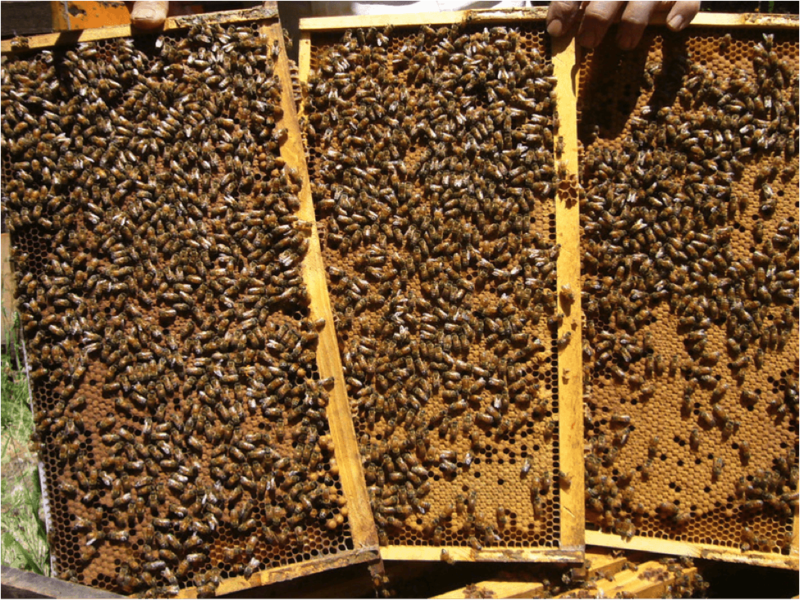 By rearranging the combs, supplying additional drawn comb, or reversing the brood chambers, the beekeeper may eliminate this cue. Harris and other researchers have noted that when they rearranged brood combs following their periodic brood measurements, that colonies would sometimes tear down started queen cells. Another time-proven method, if there is empty drawn comb at the bottom of the lower brood chamber, is to simply reverse the brood chambers. Practical application: the reversal of the brood chambers is arguably the simplest measure to take to reduce the swarm impulse. But be careful not to completely split the broodnest, especially in cold weather. You may need to move some combs to “join” a contiguous broodnest through the honey band. The placement of additional brood comb is important. It is best added directly to the side or above brood, without any intervening band of honey. Walt Wright recommends “checkerboarding” drawn combs through the “honey band” above the broodnest. This shock to the colony may arrest the swarm impulse, but consider that it may also greatly disrupt broodnest thermoregulation by the workers (with delayed effects further down the line ). Practical application: the point to keep in mind is the concept–that you want to create the impression that the broodnest is not yet fully utilized nor restricted. Any method that makes additional drawn comb available within, or immediately above or adjacent to the broodnest (or even a path of drawn comb through the honey band) can be effective. The key thing is to remove the restriction of the honey band around the broodnest. Note that bees do not recognize added frames of foundation as “comb,” but only as unused “space” in the cavity. Practical application: to the colony mind, the addition of frames or supers of foundation is an entirely different thing than adding drawn empty ready-to-use brood combs. Unless the colony is on a flow and producing “white wax,” such added foundation does not provide extra space for brood or the rearrangement of stores. I was once advised by a reputable authority that undercutting the broodnest with a box of drawn comb would avert swarming. A couple of years ago we had a chance to test that hypothesis when we ran a trial in which we wintered 150 6-frame-strength colonies in single brood chambers set atop another deep of drawn comb (so that we could feed them syrup via a top feeder during the winter). The placement of drawn comb below the cluster did not appear to thwart the swarm impulse the following spring–only a handful of those colonies expanded their cluster into the waiting lower box prior to initiating the building of swarm cells. Australian beekeepers mainly run single brood chambers, rotating drawn supers of extracted “stickies” above an excluder. The bees do not recognize that the excluder prevents the queen from expanding upward, and keep an arc of open broodnest above the excluder waiting for her. By regularly undercutting the super above the excluder with another sticky, the beekeeper prevents the colony from getting the cue that it has filled the brood area—the critical thing being that there is no band of honey below the excluder. Keep in mind that honey bees evolved to live mainly in relatively small cavities in hollow trees, and given the choice, appear to prefer cavities of about the same volume as that of a single Langstroth deep . Winston found that colonies kept in single deeps swarmed frequently—strongly suggesting that this is the natural behavior of the species (with swarming being more frequent at lower latitudes than at the northern range of the bee). However, he also found that when bees are kept in larger manmade hives, that the propensity of European honey bees (as opposed to African) to swarm is influenced not only by the population of the colony, but also by cavity size. Colonies freshly established in larger hives tend to swarm less than do those in smaller hives, instead superseding their queens rather than swarming . Winston speculates that with free-living colonies, it may be adaptive  for those in larger cavities to continue to continue to fill the cavity with stores during the first season, so that they can better survive the winter and produce multiple swarms the next spring. Practical application: most beekeepers quickly learn that colonies not given a second brood chamber will enthusiastically swarm. By continually providing the colony with more space, one may be able to trick it into “thinking” that it has not yet filled the cavity, and thus should focus upon comb building and honey storage, rather than reproduction. Assuming that you are keeping your bees in manmade hives with plenty of room, colonies are less likely to swarm with a queen in her first season than they are if the queen is older. A few factors come into play with aging queens—they tend to lay fewer eggs, and their production of queen pheromone starts to drop off—a signal to the workers that mom is getting old (Fig. 5). Figure 5. A colony is far less likely to swarm if it is headed by a young queen that is pumping out queen pheromone, as evidenced by the strong retinue of attendants around this queen. 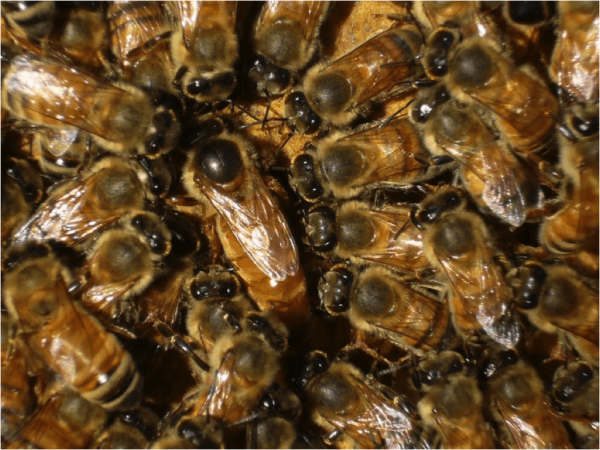 Colony congestion may reduce the distribution of her pheromones throughout the worker population, another cue contributing to the initiation of the swarm impulse. That pheromonal signal also gets diluted to some extent as the colony population grows, since it gets divvied up between more bees. Not only that, but bees may congest the broodnest by packing tightly between the combs, thus hampering the effective dispersal of the queen’s pheromones . In any case, reduction (or dilution) of queen pheromone appears to be a cue to the colony that it’s time to either supersede or swarm. Practical application: timely requeening greatly reduces the swarm impulse. Many beekeepers removing hives from almond pollination have the luxury of enough time to immediately split them (adding mated queens or queen cells) and then build them back up prior to their main honey flow. This well-proven practice both minimizes swarming, and gives the hives vigorous young queens in one shot. Fall requeening has much the same effect. A colony is loathe to swarm if the chances of either the parent hive or swarm surviving are slim due to lack of resources or poor weather (during periods of unfavorable weather, workers may destroy unemerged queens in their cells or hold emerged virgins captive in their cells for an extended period of time). Should either the bloom or weather seriously decrease the amount of pollen and nectar coming in, a colony will reverse the swarm impulse. However, swarming in general appears to be less conditional on resource abundance than upon the colony population dynamics illustrated in Fig. 2. Practical application: after favorable weather during almond bloom, if I see swarm cells in the hives, I may simply leave the colonies to “starve” a bit in the orchards after petal fall. The bees will quickly tear out the queen cells. Cutting out the queen cells: this may prevent a colony from swarming, but you only need to miss one! In practice, unless you shake off the bees off of each brood comb and look diligently, it’s really easy to miss the odd swarm cell. Clipping the queen’s wings: a clipped queen may issue with the swarm, but won’t get very far. She may get lost outside the hive (Fig. 6). This will certainly prevent her from going with the swarm, but won’t keep the bees from flying off with the first virgin to emerge. Figure 6. This old queen with worn wings was able to depart with a swarm, but didn’t get very far. The swarm abandoned her in front of the hive. Studies on the influence of the overall size of the cluster (the population of adult workers) upon swarming give conflicting data, so I’m hesitant about stating generalities. That said, given the same amount of cavity space, larger colonies tend to swarm more than do smaller colonies. The reduction of either the adult population, or division of the colony in some manner, is an effective method of reducing swarming. Unfortunately, such reduction of colony size this may come at the expense of honey production (as I’ve learned the hard way when I changed my migratory practices a few years ago ). Due to the regionally huge variation in swarm timing, plant phenology, availability of queens and drones, management goals, and the timing of honey flows, there is no one-size-fits-all recommendation for striking the perfect balance between swarm prevention and honey production. But there are a number of options. Shaking bees: California and Southern commercial beekeepers routinely shake bees from their hives in spring and sell them to other beekeepers (both as swarm prevention and as a source of income). One can also make “shook swarms” (which is also a great way to get ahead of varroa). Another method employed in Europe is to shake a colony about to swarm onto a “Taranov Board” to separate the bees by age, and then place that shook swarm of young bees and the old queen into another hive. The remaining old bees are left with the brood and ripe queen cells . Another simple way of removing part of the workforce from a strong colony is to simply move it elsewhere in the yard, leaving a weak colony in its place to pick up the drift. The beauty of this method is that it doesn’t even require the opening of a hive, and can be done any time of day or night. Walkaway splits: the lazy man’s method of making increase is to simply split hives into two, and allow the queenless half to make emergency queen cells. Although the queenless half will typically start many emergency cells (some from older larvae), the bees generally cull them heavily before emergence , and the split normally winds up with a decent quality queen (if the colony had good genetics to start with). If the queenless split is successful in mating out a queen, you’ll see fresh eggs in about 26-30 days. This method entails very little beekeeping skill, but does have a few drawbacks, mainly that the split is broodless for such a long period of time (although that helps with varroa), and that if it is not successful at mating out a queen, it will have laying workers by the time you check back (some workers will begin egglaying after about 21 days in a hopelessly queenless colony). Winston points out some additional drawbacks of the method. There is typically high brood mortality, and a strong split may still swarm anyway with the emergence of the first virgin queen. These problems may be offset by adding emerging brood from other colonies to the dequeened hives, and by destroying all but one emergency queen cell. But then you’re back to engaging in additional skilled bee work. Winston suggests the beekeepers use more sophisticated techniques for making increase (but I’ll admit that when faced with imminent swarming of yards of bees that we simply didn’t have time to deal with properly, we’ve occasionally resorted to making emergency walkaway splits). If a colony is showing signs of the swarm impulse, it’s telling you that it wants to divide itself. So why not simply control the division process yourself? Pulling out a nuc: Stealing frames of brood to make nucs (and replacing them with drawn comb) can reverse the swarm impulse. Tip for avoiding the need to find the queen: pull a few combs of brood and honey, shake all the bees from them, and place them in a hive body, above a queen excluder, back on top of the hive. Within an hour the brood combs will be covered with young bees (but not the queen), and the box can then be moved to another location and given a queen cell or mated queen (not necessary if you included a frame with a swarm cell). Practical application: a yard of equalized colonies is far easier to manage. During the linear buildup phase of colony growth, you may as well steal frames of brood and adhering young bees from colonies that will obviously peak out too early, and give them to lagging hives. Nuking the colony up: We routinely divide strong colonies after almonds into 4 nucs for sale, or 2 stronger splits for honey production. My personal observation of colonies returning from almonds is that they don’t tend to start building swarm cells until the cluster completely fills a double. We high-grade our colonies by lifting the lids, and nuc them up accordingly—allowing weaker colonies to continue building up for a bit. We find that nuking up smaller colonies is a waste of our time, since they do not yet contain enough brood for effective splitting. Another option is to split your colonies to avoid swarming, and then recombine them once the main swarm season has passed. This is essentially a modification of the Demaree method, with the added advantage of creating a stronger colony (if you can do this before the main flow), as well as requeening the hive. I’ve illustrated the method below (Fig. 7). Figure 7. The key points are to keep the old queen on the original stand along with a couple of frames of brood. If the weather is warm enough for flight, all the rest of the bees can go into the split, since enough older bees will immediately return to take care of the brood in the parent hive. The queenless split can either go on top or adjacent to the parent hive, and if it does not contain a swarm cell, gets a queen cell or mated queen. Once the main swarm season has passed (with two queens laying during the duration), you can simply recombine the two hives, and let the bees figure out which queen to keep. There are likely as many different methods of splitting colonies to avoid swarming as there are beekeepers. Try some out and see what works for you for your management, latitude, nectar flow timing, and other conditions. In my own operation, we use several different methods each spring, depending upon circumstances and our goals. Practical application: depending upon when your main honey flows are, and whether your primary goal is to make increase, sell bees, or make honey, you must decide for yourself what your best options are for management against swarming. By back calculating how large your colonies need to be at any point in time prior to the main flow, you may be able to adjust the strengths of your hives to both minimize swarming, yet allow your colonies to grow to optimal honey producing strength. Understand that as far as the colony “mind” is concerned, it is still living in a hollow tree, and makes its decisions based upon many thousands of years of evolutionary history prior to the appearance of the first beekeeper. Bees swarm when they sense that they’ve filled the cavity, and that conditions are propitious for successful survival of both the swarm and the parent colony. Understand that the initiation of the swarm impulse occurs in the deep darkness within the hive. As a beekeeper, if you can change enough of the sensory cues that trigger the swarm impulse, you may be able to prevent or even reverse it. Swarming is not necessarily a bad thing, and many beekeepers just let their bees swarm, hive those swarms that can be reached, and just wave goodbye to the rest. Be aware though, that such swarms, when they move into your neighbor’s shed, may create a nuisance. And such swarms may inadvertently introduce mites and pathogens to the feral bee population, and certainly compete for resources with your managed colonies. I’m indebted to Dr. Mark Winston (and his collaborators) for his research and thorough review of colony reproduction, and to Dr. Tom Seeley for his deep research into honey bee behavior. I’m also drawing heavily from Lloyd Harris’ monumental work on colony population dynamics. And of course, I couldn’t research these articles without the generous assistance of my partner in curiosity, Peter Borst. Winston, ML (1987) The Biology of the Honey Bee. Harvard University Press. Any further references in this article to “Winston” are from this book. A locally-adapted stock will tend to link its swarming to local plant phenology. This may not be the case for say, an Italian stock bred for full-tilt buildup no matter what. Bees closer to “wild type,” such as Russians, are ready to swarm at the drop of a hat, and need to be more carefully managed to prevent them from doing so. We’ve all heard the 17th-century adage, A swarm in May is worth a load of hay; a swarm in June is worth a silver spoon; but a swarm in July is not worth a fly. However, in areas with a fall nectar and pollen flow, a strong August/September swarm actually stands a chance of storing enough honey to survive the winter (see Winston (1980) below). Such late swarms may seem suicidal, but if the colony has already filled the cavity with honey, has excess population, and wants to rear a fresh queen for the winter, it may as well send the successful old queen out on a high-risk venture to attempt to establish a colony on the fall flow. Winston, ML (1980) Swarming, afterswarming, and reproductive rate of unmanaged honeybee colonies (Apis mellifera). Insectes Sociaux 27(4): 391-398. See Part 5 of this series for graphical representation of why this occurs. Please refer to previous articles in this series for citations. The technique is better described in Dadant’s The Hive and the Honey Bee, p. 630 in the 1992 edition. Harris discusses this in his thesis. Well reviewed on pp. 54-58 of Seeley, TD (2010) Honeybee Democracy. Princeton Univ. Press. Winston (1987) op. cit., p. 197, citing Morales. By “adaptive,” I mean favored by natural selection. Such congestion my also reduce the distribution of the queen’s “footprint pheromone,” which inhibits queen cup construction. I’m no novice to beekeeping, but I’m sure learning all the time. As a California beekeeper, I made enough income per hive from pollination contracts and nuc sales that I didn’t need to produce a honey crop, other than what the bees needed for winter stores. But some years ago I dropped my longstanding migration to the alfalfa bloom in early July, where I could count on strong singles drawing at least a deep of foundation and filling it with honey. Although splitting my colonies heavily after almonds used to work perfectly to prevent swarming, nowadays I’m trying to produce a surplus of local honey about 5 weeks earlier in the season, and the shorter time period no longer allows my nucs to build to enough strength to do so, especially during our prolonged drought. So I’m now in the same boat as other beekeepers, and am being forced to learn how to keep bees for actual honey production. The caution is often raised that the emergency queens reared in walkaway splits may be inferior, due to those from older larvae emerging first. This concern is not supported by actual data. Tofilski [[xvii]] found that there is an intense culling process that takes place within the hive, resulting in the vast majority of successfully emerging queens having been reared from very young larvae.